Home / DNP Programs / What Is the Average Salary with a DNP Degree? 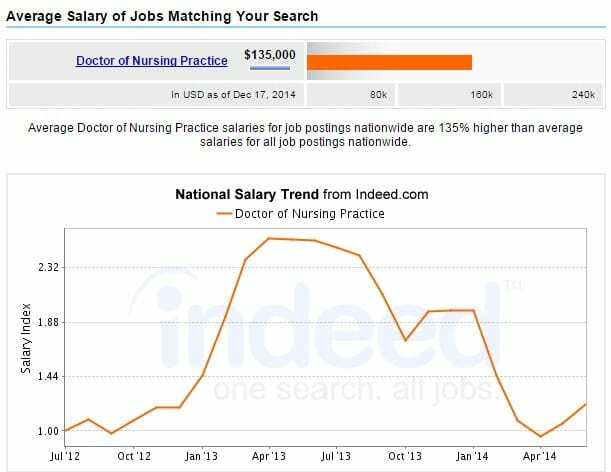 What Is the Average Salary with a DNP Degree? Becoming a nurse can be achieved through a number of different pathways. At the lowest end, people can start by obtaining a diploma and registering as an LPN (Licensed Practical Nurse) or LVN (Licensed Vocational Nurse). From there, they can move on to an Associate’s Degree and Bachelor’s Degree (BSN) and become a Registered Nurse (RN). After gaining their BSN degree, they can move on to their Master’s degree (MSN) and from there, finally, to their Doctorate of Nursing Practice (DNP) degree. Getting up to that level is expensive, but it does also open a greater variety of job opportunities in various healthcare organizations. But the exact salary that someone with a DNP will vary depending on where they work and how much experience they have. More and more nurses are choosing to study on towards their DNP degree. This is a result of the fact that many states are now looking for a greater number of advanced practice nurses with a doctorate, and not just a master’s degree. A doctorate degree in nursing is a clinical degree. This means that, once the degree is obtained, you can get to work in research or education, often moving away from ward work or working directly with patients. The length of time required to complete a DNP depends on prior qualifications and the chosen field. Additionally, a DNP can often be completed online, either in full or in part, which will also affect the length of time it takes to complete it. On average, it usually takes five semesters to obtain this degree. Nurse Practitioner, where you will still work directly with patients. Generally, you will be able to prescribe medication as well. Clinical Nurse Specialist, where you will provide clinical advice on specific conditions. Nurse Anesthetist, where you work side by side with an anesthesiologist during surgical procedures. Nurse Midwife, where you will work delivering babies and offering pre and post-natal care. Nurse Educator, where you will train future nursing students at university. Once you hold a DNP degree, you can become employed across the full spectrum of healthcare organizations, from community health centers to hospitals and from private clinics to universities. There are a number of different factors that will influence the average salary of someone with a DNP degree. Some of these factors include the area of specialization, the employer, years of experience and geographical location. Meanwhile, according to Payscale.com, the highest earning nurses are the Advanced Registered Nurse Practitioners, who can earn up to $111,870 per year. The U.S. Bureau of Labor Statistics has projected that there will be at least a 19% job growth for nurses in general by 2022. Additionally, salary expectations are likely to rise by 22% in that same time period. Additionally, those with the highest levels of education also earn the highest salaries. The field of nursing as a whole is seeing incredible and rapid growth. This is due to a number of factors, including the aging population and the aging nursing workforce. One particular issue is that the educating workforce is retiring, which is leaving a shortage in people qualified to train the next generation of nurses. Those who hold a DNP degree, therefore, are strongly encouraged to become nurse educators to help meet this demand. Additionally, as an increasing number of employers are looking specifically at recruiting advanced practice nurses, there is a growing demand for those holding a DNP degree as well.